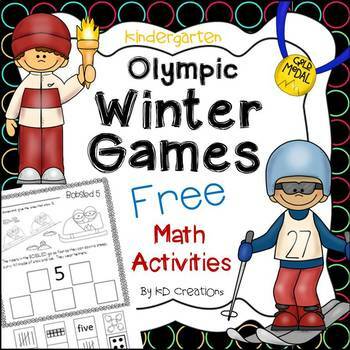 Kindergarten students will have fun learning about the Winter Olympic Games while practicing their math skills. Learn about skating, skiing and other Olympic events with tally, ten frame and domino sorting. This freebie includes 4 pages of math sorting for the numbers 5, 6, 7 and 8. Students will sort for the correct dominoes, tallying, dice, number words, counting items, snap cubes and ten frames. Here is a link to our product which includes many literacy and math activities with more Olympic event information! Don't forget to follow our store so we can let you know about future freebies, new products and sales! And be sure to leave feedback so you will earn TpT credits for your purchases!